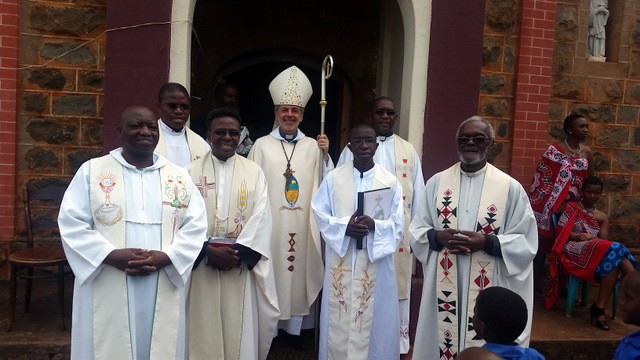 The Diocese of Manzini has, at present, 16 parishes. We know each one of them by the name of their patron saint: St Mary’s, St Peter & Paul, St Phillip’s… There was, though, one exception: the one we used to call “Florence Mission” or “St Florence”. There has never been a St Florence in our diocese. Florence is the name of the area, the name of the Clinic and the name of the school. The parish is called: “Santissima Anunziata” as it is link to the Shrine of the same name in … Florence (Italy!). Slowly, we are all becoming more familiar with the name of the parish which has a beautiful picture of the Annunciation of the Lord behind the altar. For the last two or three years, the parish celebrates her patronal feast which should normally be on March 25 (nine months before Christmas). It is sometimes moved to a later date when it “clashes” with another feast. Like this year when we celebrated our Palm Sunday on that day. Both primary and high school children were present at the Mass together with some of the parishioners who could attend on a Monday morning. Members of the Order of the Servants of Mary together with some diocesan priests too. While I presided Mass, it was Fr Wandile Dlamini OSM who gave the homily. 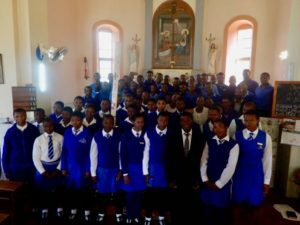 “Florence choir” is one of the best in the country and therefore I asked them to sing a couple of songs after Mass to be shared on social media.